Palette knives, spatulas, spreading tools, painting knives. Different types of spreading tools are available on our Spreaders and Putty knives, scrapers pages. 3" blade length, 6 1/2" overall length. 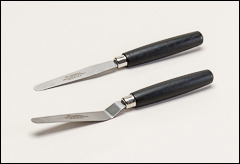 These palette knives have semi-flex steel blades with black wood handles. 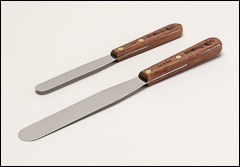 Laboratory type stainless spatulas. Natural rosewood handle, brass rivets, and a flexible stainless steel blade. 12/box but sold in any quantity.